Beginner to advanced, acoustic to electric, Blues to Rock... we have the guitar lessons you need to move your playing forward. We consistently film, edit and publish around 11 hours of new guitar lessons every 30 days; an enormous amount of material to keep your playing focused and interests piqued. With new lessons added on a daily basis, you cannot find another company as dedicated to teaching you how to play guitar as Closetlabs. So you're ready to learn how to play guitar, eh? Good. That's awesome. Your cool points just went up from 10 to 11. And just like any new skill, you'll have to start from the beginning. But the great thing is, if you work hard and keep at the basic skills when learning how to play guitar, you'll lay yourself a killer foundation and you'll be rockin' out before you know it. Take a look at our list of fourteen reasons you should take music lessons. Then, get to work! Oh, and don't forget to sign up for a free TrueFire All Access Plan, which gives you 30 days of unlimited access to our guitar lessons. Plus, what amounts to an All Access Pass to all our downloads - (When they become available) and much more! REDUCE STRESS & BE HAPPY! When I was a young teenager I fell in love with the guitar. It was it's symmetric shape at first that drew me closer. The guitar has a wonderful shape and size. It felt great in the hands and the woods used in it's construction where warm and always smelled of roses. It was around this time that I first heard it played by a master and another miracle was revealed, the guitar could produce more than one melody at a time. In musical language this is called polyphony, many voices. It was a very important discovery for me because I knew at that point in time that I would try to make a life with the guitar. There is a particular quality to the sound of a plucked string. In listening to recordings I was struck by the very human quality of the tones. The strings sounded like voices from a choir. Tone, the color of the sound, is a quality of the guitar that keeps me listening and practicing. I have continued to work for 30 years to produce my best sound. I have to practice every day to hear what a great sound could feel like. There is another attractive feature of the guitar, it's mobility. I could take my guitar anywhere. I put it in it's case and took it with me so that I never had to worry about being apart from It. This was so important for me because I moved a lot when I was young and I grew up in a boarding school where my guitar was a very needed and familiar friend. The guitar gave me an opportunity to build a landscape of sound that I could visit every time I picked it up. A world of music, pieces of art from as far back as 600 years. This was a very important connection I had with practice and the masters of the guitar's history. The guitar is an instrument that fits me particularly well because it is a very individualistic instrument. 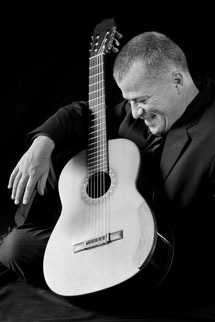 An instrument that can be played in many different ways and reveals the personality of the person playing it. The fact that the music is created with hands on the strings makes this possible. There is nothing in between the hands and and the music. Finally, there is the love of music itself. An instrument is only a means to enter the world of music. It is music itself that has kept me working to get better as a player. Music gave me something to concentrate on when I could not concentrate. It gave me a purpose when I felt none. Music gave me hope for the future when I felt I was going nowhere. The work of the guitar taught me what can be achieved with daily practice. There was no other subject that did this for me while I was growing up. Even today the guitar still challenges me to no end. I still have to work hard to create and the next level of skill is always in the future after daily work. Today I get to show others how to create their own world of music to inhabit. I am in a very privileged place where I am blessed with the work of introducing this miracle of sound, the process of practice and improvement. It is in teaching also that the magic of the guitar is revealed through the spark and fires of inspiration that emerge from my students. My students help show me why I love the guitar. The piano is an acoustic, stringed musical instrument invented in Italy by Bartolomeo Cristofori around the year 1700 (the exact year is uncertain), in which the strings are struck by hammers. It is played using a keyboard, which is a row of keys (small levers) that the performer presses down or strikes with the fingers and thumbs of both hands to cause the hammers to strike the strings. The word piano is a shortened form of pianoforte, the Italian term for the early 1700s versions of the instrument, which in turn derives from gravicembalo col piano e forte and fortepiano. The Italian musical terms piano and forte indicate "soft" and "loud" respectively, in this context referring to the variations in volume (i.e., loudness) produced in response to a pianist's touch or pressure on the keys: the greater the velocity of a key press, the greater the force of the hammer hitting the strings, and the louder the sound of the note produced and the stronger the attack. The first fortepianos in the 1700s had a quieter sound and smaller dynamic range. An acoustic piano usually has a protective wooden case surrounding the soundboard and metal strings, which are strung under great tension on a heavy metal frame. Pressing one or more keys on the piano's keyboard causes a padded hammer (typically padded with firm felt) to strike the strings. The hammer rebounds from the strings, and the strings continue to vibrate at their resonant frequency. These vibrations are transmitted through a bridge to a soundboard that amplifies by more efficiently coupling the acoustic energy to the air. When the key is released, a damper stops the strings' vibration, ending the sound. Notes can be sustained, even when the keys are released by the fingers and thumbs, by the use of pedals at the base of the instrument. The sustain pedal enables pianists to play musical passages that would otherwise be impossible, such as sounding a 10-note chord in the lower register and then, while this chord is being continued with the sustain pedal, shifting both hands to the treble range to play a melody and arpeggios over the top of this sustained chord. Unlike the pipe organ and harpsichord, two major keyboard instruments widely used before the piano, the piano allows gradations of volume and tone according to how forcefully a performer presses or strikes the keys. Most modern pianos have a row of 88 black and white keys, 52 white keys for the notes of the C major scale (C, D, E, F, G, A and B) and 36 shorter black keys, which are raised above the white keys, and set further back on the keyboard. This means that the piano can play 88 different pitches (or "notes"), going from the deepest bass range to the highest treble. The black keys are for the "accidentals" (F?/G?, G?/A?, A?/B?, C?/D?, and D?/E? ), which are needed to play in all twelve keys. More rarely, some pianos have additional keys (which require additional strings). Most notes have three strings, except for the bass that graduates from one to two. The strings are sounded when keys are pressed or struck, and silenced by dampers when the hands are lifted from the keyboard. Although an acoustic piano has strings, it is usually classified as a percussion instrument rather than as a stringed instrument, because the strings are struck rather than plucked (as with a harpsichord or spinet); in the Hornbostelâ€“Sachs system of instrument classification, pianos are considered chordophones. There are two main types of piano: the grand piano and the upright piano. The grand piano is used for Classical solos, chamber music, and art song, and it is often used in jazz and pop concerts. The upright piano, which is more compact, is the most popular type, as it is a better size for use in private homes for domestic music-making and practice. During the 1800s, influenced by the musical trends of the Romantic music era, innovations such as the cast iron frame (which allowed much greater string tensions) and aliquot stringing gave grand pianos a more powerful sound, with a longer sustain and richer tone. In the nineteenth century, a family's piano played the same role that a radio or phonograph played in the twentieth century; when a nineteenth-century family wanted to hear a newly published musical piece or symphony, they could hear it by having a family member play it on the piano. During the nineteenth century, music publishers produced many musical works in arrangements for piano, so that music lovers could play and hear the popular pieces of the day in their home. The piano is widely employed in classical, jazz, traditional and popular music for solo and ensemble performances, accompaniment, and for composing, songwriting and rehearsals. Although the piano is very heavy and thus not portable and is expensive (in comparison with other widely used accompaniment instruments, such as the acoustic guitar), its musical versatility (i.e., its wide pitch range, ability to play chords with up to 10 notes, louder or softer notes and two or more independent musical lines at the same time), the large number of musicians and amateurs trained in playing it, and its wide availability in performance venues, schools and rehearsal spaces have made it one of the Western world's most familiar musical instruments. With technological advances, amplified electric pianos (1929), electronic pianos (1970s), and digital pianos (1980s) have also been developed. The electric piano became a popular instrument in the 1960s and 1970s genres of jazz fusion, funk music and rock music. 1720 fortepiano by Italian maker Bartolomeo Cristofori, the world's oldest surviving piano. Metropolitan Museum of Art, New York City. Early piano replica by the modern builder Paul McNulty, after Walter & Sohn, 1805 The piano was founded on earlier technological innovations in keyboard instruments. Pipe organs have been used since Antiquity, and as such, the development of pipe organs enabled instrument builders to learn about creating keyboard mechanisms for sounding pitches. The first string instruments with struck strings were the hammered dulcimers, which were used since the Middle Ages in Europe. During the Middle Ages, there were several attempts at creating stringed keyboard instruments with struck strings. By the 17th century, the mechanisms of keyboard instruments such as the clavichord and the harpsichord were well developed. In a clavichord, the strings are struck by tangents, while in a harpsichord, they are mechanically plucked by quills when the performer depresses the key. Centuries of work on the mechanism of the harpsichord in particular had shown instrument builders the most effective ways to construct the case, soundboard, bridge, and mechanical action for a keyboard intended to sound strings. See also: Bartolomeo Cristofori The invention of the piano is credited to Bartolomeo Cristofori (1655â€“1731) of Padua, Italy, who was employed by Ferdinando de' Medici, Grand Prince of Tuscany, as the Keeper of the Instruments. Cristofori was an expert harpsichord maker, and was well acquainted with the body of knowledge on stringed keyboard instruments. He used his knowledge of harpsichord keyboard mechanisms and actions to help him to develop the first pianos. It is not known exactly when Cristofori first built a piano. An inventory made by his employers, the Medici family, indicates the existence of a piano by the year 1700; another document of doubtful authenticity indicates a date of 1698. The three Cristofori pianos that survive today date from the 1720s. Cristofori named the instrument un cimbalo di cipresso di piano e forte ("a keyboard of cypress with soft and loud"), abbreviated over time as pianoforte, fortepiano, and later, simply, piano. While the clavichord allows expressive control of volume and sustain, it is too quiet for large performances in big halls. The harpsichord produces a sufficiently loud sound, especially when a coupler joins each key to both manuals of a two-manual harpsichord, but it offers no dynamic or accent-based expressive control over each note. A harpsichord cannot produce a variety of dynamic levels from the same keyboard during a musical passage (though a player can use a harpsichord with two manuals to alternate between two different stops [settings on the harpsichord that determine which set of strings sound], which could include a louder stop and a quieter stop). The piano offers the best of both instruments, combining the ability to play loudly and perform sharp accents. The piano can project more during piano concertos and play in larger venues, with dynamic control that permits a range of dynamics, including soft, quiet playing. Cristofori's great success was solving, with no known prior example, the fundamental mechanical problem of designing a stringed keyboard instrument in which the notes are struck by a hammer. The hammer must strike the string, but not remain in contact with it, because this would damp the sound and stop the string from vibrating and making sound. This means that after striking the string, the hammer must be lifted or raised off the strings. Moreover, the hammer must return to its rest position without bouncing violently, and it must return to a position in which it is ready to play almost immediately after its key is depressed so the player can repeat the same note rapidly. Cristofori's piano action was a model for the many approaches to piano actions that followed in the next century. Cristofori's early instruments were made with thin strings, and were much quieter than the modern piano, but they were much louder and with more sustain in comparison to the clavichordâ€”the only previous keyboard instrument capable of dynamic nuance via the weight or force with which the keyboard is played. Cristofori's new instrument remained relatively unknown until an Italian writer, Scipione Maffei, wrote an enthusiastic article about it in 1711, including a diagram of the mechanism, that was translated into German and widely distributed. Most of the next generation of piano builders started their work based on reading the article. One of these builders was Gottfried Silbermann, better known as an organ builder. Silbermann's pianos were virtually direct copies of Cristofori's, with one important addition: Silbermann invented the forerunner of the modern sustain pedal, which lifts all the dampers from the strings simultaneously. This allows the pianist to sustain the notes that they have depressed even after their fingers are no longer pressing down the keys. This innovation enabled pianists to, for example, play a loud chord with both hands in the lower register of the instrument, sustain the chord with the sustain pedal, and then, with the chord continuing to sound, relocate their hands to a different register of the keyboard in preparation for a subsequent section. Grand piano by Louis Bas of Villeneuve-lÃ¨s-Avignon, 1781. Earliest French grand piano known to survive; includes an inverted wrestplank and action derived from the work of Bartolomeo Cristofori (ca. 1700) with ornately decorated soundboard. Silbermann showed Johann Sebastian Bach one of his early instruments in the 1730s, but Bach did not like the instrument at that time, claiming that the higher notes were too soft to allow a full dynamic range. Although this earned him some animosity from Silbermann, the criticism was apparently heeded. Bach did approve of a later instrument he saw in 1747, and even served as an agent in selling Silbermann's pianos. "Instrument: piano et forte genandt"â€“a reference to the instrument's ability to play soft and loudâ€“was an expression that Bach used to help sell the instrument when he was acting as Silbermann's agent in 1749. Piano-making flourished during the late 18th century in the Viennese school, which included Johann Andreas Stein (who worked in Augsburg, Germany) and the Viennese makers Nannette Streicher (daughter of Stein) and Anton Walter. Viennese-style pianos were built with wood frames, two strings per note, and leather-covered hammers. Some of these Viennese pianos had the opposite coloring of modern-day pianos; the natural keys were black and the accidental keys white. It was for such instruments that Wolfgang Amadeus Mozart composed his concertos and sonatas, and replicas of them are built in the 21st century for use in authentic-instrument performance of his music. The pianos of Mozart's day had a softer, more ethereal tone than 21st century pianos or English pianos, with less sustaining power. The term fortepiano now distinguishes these early instruments (and modern re-creations) from later pianos. In the period from about 1790 to 1860, the Mozart-era piano underwent tremendous changes that led to the modern form of the instrument. This revolution was in response to a preference by composers and pianists for a more powerful, sustained piano sound, and made possible by the ongoing Industrial Revolution with resources such as high-quality piano wire for strings, and precision casting for the production of massive iron frames that could withstand the tremendous tension of the strings. Over time, the tonal range of the piano was also increased from the five octaves of Mozart's day to the seven octave (or more) range found on modern pianos. Early technological progress in the late 1700s owed much to the firm of Broadwood. John Broadwood joined with another Scot, Robert Stodart, and a Dutchman, Americus Backers, to design a piano in the harpsichord caseâ€”the origin of the "grand". They achieved this in about 1777. They quickly gained a reputation for the splendour and powerful tone of their instruments, with Broadwood constructing pianos that were progressively larger, louder, and more robustly constructed. They sent pianos to both Joseph Haydn and Ludwig van Beethoven, and were the first firm to build pianos with a range of more than five octaves: five octaves and a fifth during the 1790s, six octaves by 1810 (Beethoven used the extra notes in his later works), and seven octaves by 1820. The Viennese makers similarly followed these trends; however the two schools used different piano actions: Broadwoods used a more robust action, whereas Viennese instruments were more sensitive. By the 1820s, the center of piano innovation had shifted to Paris, where the Pleyel firm manufactured pianos used by FrÃ©dÃ©ric Chopin and the Ã‰rard firm manufactured those used by Franz Liszt. In 1821, SÃ©bastien Ã‰rard invented the double escapement action, which incorporated a repetition lever (also called the balancier) that permitted repeating a note even if the key had not yet risen to its maximum vertical position. This facilitated rapid playing of repeated notes, a musical device exploited by Liszt. When the invention became public, as revised by Henri Herz, the double escapement action gradually became standard in grand pianos, and is still incorporated into all grand pianos currently produced in the 2000s. Other improvements of the mechanism included the use of firm felt hammer coverings instead of layered leather or cotton. Felt, which was first introduced by Jean-Henri Pape in 1826, was a more consistent material, permitting wider dynamic ranges as hammer weights and string tension increased. The sostenuto pedal (see below), invented in 1844 by Jean-Louis Boisselot and copied by the Steinway firm in 1874, allowed a wider range of effects, such as playing a 10 note chord in the bass range, sustaining it with the pedal, and then moving both hands over to the treble range to play a two-hand melody or sequence of arpeggios. One innovation that helped create the powerful sound of the modern piano was the use of a massive, strong, cast iron frame. Also called the "plate", the iron frame sits atop the soundboard, and serves as the primary bulwark against the force of string tension that can exceed 20 tons (180 kilonewtons) in a modern grand. The single piece cast iron frame was patented in 1825 in Boston by Alpheus Babcock, combining the metal hitch pin plate (1821, claimed by Broadwood on behalf of Samuel HervÃ©) and resisting bars (Thom and Allen, 1820, but also claimed by Broadwood and Ã‰rard). Babcock later worked for the Chickering & Mackays firm who patented the first full iron frame for grand pianos in 1843. Composite forged metal frames were preferred by many European makers until the American system was fully adopted by the early 20th century. The increased structural integrity of the iron frame allowed the use of thicker, tenser, and more numerous strings. In 1834, the Webster & Horsfal firm of Birmingham brought out a form of piano wire made from cast steel; according to Dolge it was "so superior to the iron wire that the English firm soon had a monopoly." But a better steel wire was soon created in 1840 by the Viennese firm of Martin Miller, and a period of innovation and intense competition ensued, with rival brands of piano wire being tested against one another at international competitions, leading ultimately to the modern form of piano wire. Other important advances included changes to the way the piano is strung, such as the use of a "choir" of three strings rather than two for all but the lowest notes, and the implementation of an over-strung scale, in which the strings are placed in two separate planes, each with its own bridge height. (This is also called cross-stringing. Whereas earlier instruments' bass strings were a mere continuation of a single string plane, over-stringing placed the bass bridge behind and to the treble side of the tenor bridge area. This crossed the strings, with the bass strings in the higher plane.) This permitted a much narrower cabinet at the "nose" end of the piano, and optimized the transition from unwound tenor strings to the iron or copper-wrapped bass strings. Over-stringing was invented by Pape during the 1820s, and first patented for use in grand pianos in the United States by Henry Steinway, Jr. in 1859. Some piano makers developed schemes to enhance the tone of each note. Julius BlÃ¼thner developed Aliquot stringing in 1893 as well as Pascal Taskin (1788), and Collard & Collard (1821). These systems were used to strengthen the tone of the highest register of notes on the piano, which up till this time were viewed as being too weak-sounding. Each used more distinctly ringing, undamped vibrations of sympathetically vibrating strings to add to the tone, except the BlÃ¼thner Aliquot stringing, which uses an additional fourth string in the upper two treble sections. While the hitchpins of these separately suspended Aliquot strings are raised slightly above the level of the usual tri-choir strings, they are not struck by the hammers but rather are damped by attachments of the usual dampers. Eager to copy these effects, Theodore Steinway invented duplex scaling, which used short lengths of non-speaking wire bridged by the "aliquot" throughout much of upper the range of the piano, always in locations that caused them to vibrate sympathetically in conformity with their respective overtonesâ€”typically in doubled octaves and twelfths. The mechanical action structure of the upright piano was invented in London, England in 1826 by Robert Wornum, and upright models became the most popular model. Upright pianos took less space than a grand piano, and as such they were a better size for use in private homes for domestic music-making and practice. Some early pianos had shapes and designs that are no longer in use. The square piano (not truly square, but rectangular) was cross strung at an extremely acute angle above the hammers, with the keyboard set along the long side. This design is attributed to Gottfried Silbermann or Christian Ernst Friderici on the continent, and Johannes Zumpe or Harman Vietor in England, and it was improved by changes first introduced by Guillaume-Lebrecht Petzold in France and Alpheus Babcock in the United States. Square pianos were built in great numbers through the 1840s in Europe and the 1890s in the United States, and saw the most visible change of any type of piano: the iron-framed, over-strung squares manufactured by Steinway & Sons were more than two-and-a-half times the size of Zumpe's wood-framed instruments from a century before. Their overwhelming popularity was due to inexpensive construction and price, although their tone and performance were limited by narrow soundboards, simple actions and string spacing that made proper hammer alignment difficult. The mechanism and strings in upright pianos are perpendicular to the keys. The tall, vertically strung upright grand was arranged like a grand set on end, with the soundboard and bridges above the keys, and tuning pins below them. The term was later revived by many manufacturers for advertising purposes. "Giraffe pianos", "pyramid pianos" and "lyre pianos" were arranged in a somewhat similar fashion, using evocatively shaped cases. The very tall cabinet piano was introduced about 1805 and was built through the 1840s. It had strings arranged vertically on a continuous frame with bridges extended nearly to the floor, behind the keyboard and very large sticker action. The short cottage upright or pianino with vertical stringing, made popular by Robert Wornum around 1815, was built into the 20th century. They are informally called birdcage pianos because of their prominent damper mechanism. The oblique upright, popularized in France by Roller & Blanchet during the late 1820s, was diagonally strung throughout its compass. The tiny spinet upright was manufactured from the mid-1930s until recent times. The low position of the hammers required the use of a "drop action" to preserve a reasonable keyboard height. Modern upright and grand pianos attained their present, 2000-era forms by the end of the 19th century. While improvements have been made in manufacturing processes, and many individual details of the instrument continue to receive attention, and a small number of acoustic pianos are produced with MIDI recording and sound module-triggering capabilities, the 19th century was the era of the most dramatic innovations and modifications of the instrument. Modern acoustic pianos have two basic configurations, the grand piano and the upright piano, with various styles of each. There are also specialized and novelty pianos, electric pianos based on electromechanical designs, electronic pianos that synthesize piano-like tones using oscillators, and digital pianos using digital samples of acoustic piano sounds. "Grand piano" redirects here. For other uses, see Grand Piano (disambiguation). In grand pianos the frame and strings are horizontal, with the strings extending away from the keyboard. The action lies beneath the strings, and uses gravity as its means of return to a state of rest. There are many sizes of grand piano. A rough generalization distinguishes the concert grand (between 2.2 and 3 meters [7 ft 3 inâ€“9 ft 10 in]) from the parlor grand, or boudoir grand, (1.7 to 2.2 meters [5 ft 7 inâ€“7 ft 3 in]) and the smaller baby grand (around 1.5 meters [4 ft 11 in]). All else being equal, longer pianos with longer strings have larger, richer sound and lower inharmonicity of the strings. Inharmonicity is the degree to which the frequencies of overtones (known as partials or harmonics) sound sharp relative to whole multiples of the fundamental frequency. This results from the piano's considerable string stiffness; as a struck string decays its harmonics vibrate, not from their termination, but from a point very slightly toward the center (or more flexible part) of the string. The higher the partial, the further sharp it runs. Pianos with shorter and thicker string (i.e., small pianos with short string scales) have more inharmonicity. The greater the inharmonicity, the more the ear perceives it as harshness of tone. The inharmonicity of piano strings requires that octaves be stretched, or tuned to a lower octave's corresponding sharp overtone rather than to a theoretically correct octave. If octaves are not stretched, single octaves sound in tune, but doubleâ€”and notably tripleâ€”octaves are unacceptably narrow. Stretching a small piano's octaves to match its inherent inharmonicity level creates an imbalance among all the instrument's intervallic relationships. In a concert grand, however, the octave "stretch" retains harmonic balance, even when aligning treble notes to a harmonic produced from three octaves below. This lets close and widespread octaves sound pure, and produces virtually beatless perfect fifths. This gives the concert grand a brilliant, singing and sustaining tone qualityâ€”one of the principal reasons that full-size grands are used in the concert hall. Smaller grands satisfy the space and cost needs of domestic use; as well, they are used in some small teaching studios and smaller performance venues. August FÃ¶rster upright piano Upright pianos, also called vertical pianos, are more compact because the frame and strings are vertical. Upright pianos are generally less expensive than grand pianos. Upright pianos are widely used in churches, community centers, schools, music conservatories and university music programs as rehearsal and practice instruments, and they are popular models for in-home purchase. The hammers move horizontally, and return to their resting position via springs, which are susceptible to degradation. Upright pianos with unusually tall frames and long strings are sometimes called upright grand pianos. Some authors classify modern pianos according to their height and to modifications of the action that are necessary to accommodate the height. Studio pianos are around 107 to 114 cm (42â€“45 in) tall. This is the shortest cabinet that can accommodate a full-sized action located above the keyboard. Console pianos have a compact action (shorter hammers), and are a few inches shorter than studio models. The top of a spinet model barely rises above the keyboard. The action is located below, operated by vertical wires that are attached to the backs of the keys. The toy piano, introduced in the 19th century, is a small piano-like instrument, that generally uses round metal rods to produce sound, rather than strings. The US Library of Congress recognizes the toy piano as a unique instrument with the subject designation, Toy Piano Scores: M175 T69. In 1863, Henri Fourneaux invented the player piano, which plays itself from a piano roll. A machine perforates a performance recording into rolls of paper, and the player piano replays the performance using pneumatic devices. Modern equivalents of the player piano include the BÃ¶sendorfer CEUS, Yamaha Disklavier and QRS Pianomation, using solenoids and MIDI rather than pneumatics and rolls. A silent piano is an acoustic piano having an option to silence the strings by means of an interposing hammer bar. They are designed for private silent practice, to avoid disturbing others. Edward Ryley invented the transposing piano in 1801. This rare instrument has a lever under the keyboard as to move the keyboard relative to the strings so a pianist can play in a familiar key while the music sounds in a different key. The minipiano 'Pianette' model viewed with its original matching stool; the wooden flap at the front of the instrument has been dropped revealing the tuning pins at the front. The minipiano is an instrument patented by the Brasted brothers of the Eavestaff Ltd. piano company in 1934. This instrument has a braceless back, and a soundboard positioned below the keysâ€”meaning that long metal rods pulled on the levers to make the hammers strike the strings. The first model, known as the Pianette, was unique in that the tuning pins extended through the instrument, so it could be tuned at the front. The prepared piano, present in some contemporary art music from the 20th and 21st century is a piano with objects placed inside it to alter its sound, or has had its mechanism changed in some other way. The scores for music for prepared piano specify the modifications, for example instructing the pianist to insert pieces of rubber, paper, metal screws, or washers in between the strings. These either mute the strings or alter their timbre. A harpsichord-like sound can be produced by placing or dangling small metal buttons in front of the hammer. Adding an eraser between the bass strings produces a mellow, thumpy sound reminiscent of the plucked double bass. Inserting metal screws or washers can cause the piano to make a jangly sound as these metal items vibrate against the strings. In 1954 a German company exhibited a wire-less piano at the Spring Fair in Frankfurt, Germany that sold for US$238. The wires were replaced by metal bars of different alloys that replicated the standard wires when played. A similar concept is used in the electric-acoustic Rhodes piano. Wurlitzer 210 electric piano The first electric pianos from the late 1920s used metal strings with a magnetic pickup, an amplifier and a loudspeaker. The electric pianos that became most popular in pop and rock music in the 1960s and 1970s, such as the Fender Rhodes use metal tines in place of strings and use electromagnetic pickups similar to those on an electric guitar. The resulting electrical, analogue signal can then be amplified with a keyboard amplifier or electronically manipulated with effects units. Electric pianos are rarely used in classical music, where the main usage of them is as inexpensive rehearsal or practice instruments in music schools. However, electric pianos, particularly the Fender Rhodes, became important instruments in 1970s funk and jazz fusion and in some rock music genres. Electronic pianos are non-acoustic; they do not have strings, tines or hammers, but are a type of synthesizer that simulates or imitates piano sounds using oscillators and filters that synthesize the sound of an acoustic piano. They must be connected to a keyboard amplifier and speaker to produce sound (however, some electronic keyboards have a built-in amp and speaker). Alternatively, a person can practice an electronic piano with headphones to avoid disturbing others. Digital pianos are also non-acoustic and do not have strings or hammers. They use digital sampling technology to reproduce the acoustic sound of each piano note accurately. 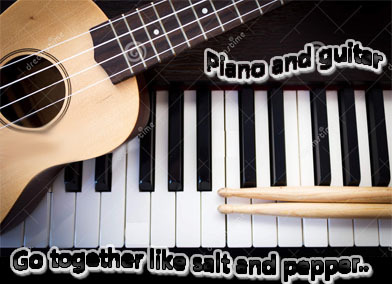 They also must be connected to a power amplifier and speaker to produce sound (however, most digital pianos have a built-in amp and speaker). Alternatively, a person can practice with headphones to avoid disturbing others. Digital pianos can include sustain pedals, weighted or semi-weighted keys, multiple voice options (e.g., sampled or synthesized imitations of electric piano, Hammond organ, violin, etc. ), and MIDI interfaces. MIDI inputs and outputs connect a digital piano to other electronic instruments or musical devices. For example, a digital piano's MIDI out signal could be connected by a patch cord to a synth module, which would allow the performer to use the keyboard of the digital piano to play modern synthesizer sounds. Early digital pianos tended to lack a full set of pedals but the synthesis software of later models such as the Yamaha Clavinova series synthesised the sympathetic vibration of the other strings (such as when the sustain pedal is depressed) and full pedal sets can now be replicated. The processing power of digital pianos has enabled highly realistic pianos using multi-gigabyte piano sample sets with as many as ninety recordings, each lasting many seconds, for each key under different conditions (e.g., there are samples of each note being struck softly, loudly, with a sharp attack, etc.). Additional samples emulate sympathetic resonance of the strings when the sustain pedal is depressed, key release, the drop of the dampers, and simulations of techniques such as re-pedalling. Digital, MIDI-equipped, pianos can output a stream of MIDI data, or record and play via a CD ROM or USB flash drive using MIDI format files, similar in concept to a pianola. The MIDI file records the physics of a note rather than its resulting sound and recreates the sounds from its physical properties (e.g., which note was struck and with what velocity). Computer based software, such as Modartt's 2006 Pianoteq, can be used to manipulate the MIDI stream in real time or subsequently to edit it. This type of software may use no samples but synthesize a sound based on aspects of the physics that went into the creation of a played note. The Yamaha Disklavier player piano. The unit mounted under the keyboard of the piano can play MIDI or audio software on its CD or floppy disk drive. In the 2000s, some pianos include an acoustic grand piano or upright piano combined with MIDI electronic features. Such a piano can be played acoustically, or the keyboard can be used as a MIDI controller, which can trigger a synthesizer module or music sampler. Some electronic feature-equipped pianos such as the Yamaha Disklavier electronic player piano, introduced in 1987, are outfitted with electronic sensors for recording and electromechanical solenoids for player piano-style playback. Sensors record the movements of the keys, hammers, and pedals during a performance, and the system saves the performance data as a Standard MIDI File (SMF). On playback, the solenoids move the keys and pedals and thus reproduce the original performance. Modern Disklaviers typically include an array of electronic features, such as a built-in tone generator for playing back MIDI accompaniment tracks, speakers, MIDI connectivity that supports communication with computing devices and external MIDI instruments, additional ports for audio and SMPTE I/O, and Internet connectivity. Disklaviers have been manufactured in the form of upright, baby grand, and grand piano styles (including a nine-foot concert grand). Reproducing systems have ranged from relatively simple, playback-only models to professional models that can record performance data at resolutions that exceed the limits of normal MIDI data. The unit mounted under the keyboard of the piano can play MIDI or audio software on its CD or floppy disk drive. Pianos can have upwards of 12,000 individual parts, supporting six functional features: keyboard, hammers, dampers, bridge, soundboard, and strings. Many parts of a piano are made of materials selected for strength and longevity. This is especially true of the outer rim. It is most commonly made of hardwood, typically hard maple or beech, and its massiveness serves as an essentially immobile object from which the flexible soundboard can best vibrate. According to Harold A. Conklin, the purpose of a sturdy rim is so that, "... the vibrational energy will stay as much as possible in the soundboard instead of dissipating uselessly in the case parts, which are inefficient radiators of sound." Outer rim of Estonia grand piano during the manufacturing process Hardwood rims are commonly made by laminating thin, hence flexible, strips of hardwood, bending them to the desired shape immediately after the application of glue. The bent plywood system was developed by C.F. Theodore Steinway in 1880 to reduce manufacturing time and costs. Previously, the rim was constructed from several pieces of solid wood, joined and veneered, and European makers used this method well into the 20th century. A modern exception, BÃ¶sendorfer, the Austrian manufacturer of high-quality pianos, constructs their inner rims from solid spruce, the same wood that the soundboard is made from, which is notched to allow it to bend; rather than isolating the rim from vibration, their "resonance case principle" allows the framework to resonate more freely with the soundboard, creating additional coloration and complexity of the overall sound. This view of the underside of a 182 cm (6-foot) grand piano shows, in order of distance from viewer: softwood braces, tapered soundboard ribs, soundboard. The metal rod at lower right is a humidity control device. The thick wooden posts on the underside (grands) or back (uprights) of the piano stabilize the rim structure, and are made of softwood for stability. The requirement of structural strength, fulfilled by stout hardwood and thick metal, makes a piano heavy. Even a small upright can weigh 136 kg (300 lb), and the Steinway concert grand (Model D) weighs 480 kg (1,060 lb). The largest piano available on the general market, the Fazioli F308, weighs 570 kg (1,260 lb). The pinblock, which holds the tuning pins in place, is another area where toughness is important. It is made of hardwood (typically hard maple or beech), and is laminated for strength, stability and longevity. Piano strings (also called piano wire), which must endure years of extreme tension and hard blows, are made of high carbon steel. They are manufactured to vary as little as possible in diameter, since all deviations from uniformity introduce tonal distortion. The bass strings of a piano are made of a steel core wrapped with copper wire, to increase their mass whilst retaining flexibility. If all strings throughout the piano's compass were individual (monochord), the massive bass strings would overpower the upper ranges. Makers compensate for this with the use of double (bichord) strings in the tenor and triple (trichord) strings throughout the treble. The plate (harp), or metal frame, of a piano is usually made of cast iron. A massive plate is advantageous. Since the strings vibrate from the plate at both ends, an insufficiently massive plate would absorb too much of the vibrational energy that should go through the bridge to the soundboard. While some manufacturers use cast steel in their plates, most prefer cast iron. Cast iron is easy to cast and machine, has flexibility sufficient for piano use, is much more resistant to deformation than steel, and is especially tolerant of compression. Plate casting is an art, since dimensions are crucial and the iron shrinks about one percent during cooling. Including an extremely large piece of metal in a piano is potentially an aesthetic handicap. Piano makers overcome this by polishing, painting, and decorating the plate. Plates often include the manufacturer's ornamental medallion. In an effort to make pianos lighter, Alcoa worked with Winter and Company piano manufacturers to make pianos using an aluminum plate during the 1940s. Aluminum piano plates were not widely accepted, and were discontinued. The numerous parts of a piano action are generally made from hardwood, such as maple, beech, and hornbeam, however, since World War II, makers have also incorporated plastics. Early plastics used in some pianos in the late 1940s and 1950s, proved disastrous when they lost strength after a few decades of use. Beginning in 1961, the New York branch of the Steinway firm incorporated Teflon, a synthetic material developed by DuPont, for some parts of its Permafree grand action in place of cloth bushings, but abandoned the experiment in 1982 due to excessive friction and a "clicking" that developed over time; Teflon is "humidity stable" whereas the wood adjacent to the Teflon swells and shrinks with humidity changes, causing problems. 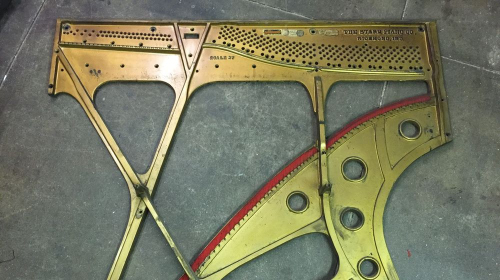 More recently, the Kawai firm built pianos with action parts made of more modern materials such as carbon fiber reinforced plastic, and the piano parts manufacturer Wessell, Nickel and Gross has launched a new line of carefully engineered composite parts. Thus far these parts have performed reasonably, but it will take decades to know if they equal the longevity of wood. In all but the lowest quality pianos the soundboard is made of solid spruce (that is, spruce boards glued together along the side grain). Spruce's high ratio of strength to weight minimizes acoustic impedance while offering strength sufficient to withstand the downward force of the strings. The best piano makers use quarter-sawn, defect-free spruce of close annular grain, carefully seasoning it over a long period before fabricating the soundboards. This is the identical material that is used in quality acoustic guitar soundboards. Cheap pianos often have plywood soundboards. The design of the piano hammers requires having the hammer felt be soft enough so that it will not create loud, very high harmonics that a hard hammer will cause. The hammer must be lightweight enough to move swiftly when a key is pressed; yet at the same time, it must be strong enough so that it can hit strings hard when the player strikes the keys forcefully for fortissimo playing or sforzando accents. Piano Keyboard An 88-key piano, with the octaves numbered and Middle C (cyan) and A440 (yellow) highlighted. In the early years of piano construction, keys were commonly made from sugar pine. In the 2010s, they are usually made of spruce or basswood. Spruce is typically used in high-quality pianos. Black keys were traditionally made of ebony, and the white keys were covered with strips of ivory. However, since ivory-yielding species are now endangered and protected by treaty, or are illegal in some countries, makers use plastics almost exclusively. Also, ivory tends to chip more easily than plastic. Legal ivory can still be obtained in limited quantities. The Yamaha firm invented a plastic called Ivorite that they claim mimics the look and feel of ivory. It has since been imitated by other makers. Almost every modern piano has 52 white keys and 36 black keys for a total of 88 keys (seven octaves plus a minor third, from A0 to C8). Many older pianos only have 85 keys (seven octaves from A0 to A7). Some piano manufacturers have extended the range further in one or both directions. For example, the Imperial BÃ¶sendorfer has nine extra keys at the bass end, giving a total of 97 keys and an eight octave range. These extra keys are sometimes hidden under a small hinged lid that can cover the keys to prevent visual disorientation for pianists unfamiliar with the extra keys, or the colours of the extra white keys are reversed (black instead of white). More recently, manufacturer Stuart & Sons created a piano with 102 keys, going from C0 to F8. The extra keys are the same as the other keys in appearance. The extra keys are added primarily for increased resonance from the associated strings; that is, they vibrate sympathetically with other strings whenever the damper pedal is depressed and thus give a fuller tone. Only a very small number of works composed for piano actually use these notes. There is a rare variant of piano that has double keyboards called the EmÃ¡nuel MoÃ³r Pianoforte. It was invented by Hungarian composer and pianist, EmÃ¡nuel MoÃ³r (19 February 1863 â€“ 20 October 1931). It consisted of two keyboards lying one above each other. The lower keyboard has the usual 88 keys and the upper keyboard has 76 keys. When pressing the upper keyboard the internal mechanism pulls down the corresponding key on the lower keyboard, but an octave higher. This lets a pianist reach two octaves with one hand, impossible on a conventional piano. Due to its double keyboard musical work that were originally created for double-manual harpsichord such as Goldberg Variations by Bach become much easier to play, since playing on a conventional single keyboard piano involve complex and hand-tangling cross-hand movements. The design also featured a special fourth pedal that coupled the lower and upper keyboard, so when playing on the lower keyboard the note one octave higher also played. Only about 60 EmÃ¡nuel MoÃ³r Pianoforte were made, mostly manufactured by BÃ¶sendorfer. Other piano manufactures such as Bechstein, Chickering, and Steinway & Sons had also manufactured a few. Pianos have been built with alternative keyboard systems, e.g., the JankÃ³ keyboard. Piano pedals from left to right: una corda, sostenuto and sustain pedal Pianos have had pedals, or some close equivalent, since the earliest days. (In the 18th century, some pianos used levers pressed upward by the player's knee instead of pedals.) Most grand pianos in the US have three pedals: the soft pedal (una corda), sostenuto, and sustain pedal (from left to right, respectively), while in Europe, the standard is two pedals: the soft pedal and the sustain pedal. Most modern upright pianos also have three pedals: soft pedal, practice pedal and sustain pedal, though older or cheaper models may lack the practice pedal. In Europe the standard for upright pianos is two pedals: the soft and the sustain pedals. The sustain pedal (or, damper pedal) is often simply called "the pedal", since it is the most frequently used. It is placed as the rightmost pedal in the group. It lifts the dampers from all keys, sustaining all played notes. In addition, it alters the overall tone by allowing all strings, including those not directly played, to reverberate. When all of the other strings on the piano can vibrate, this allows sympathetic vibration of strings that are harmonically related to the sounded pitches. For example, if the pianist plays the 440 Hz "A" note, the higher octave "A" notes will also sound sympathetically. The soft pedal or una corda pedal is placed leftmost in the row of pedals. In grand pianos it shifts the entire action/keyboard assembly to the right (a very few instruments have shifted left) so that the hammers hit two of the three strings for each note. In the earliest pianos whose unisons were bichords rather than trichords, the action shifted so that hammers hit a single string, hence the name una corda, or 'one string'. The effect is to soften the note as well as change the tone. In uprights this action is not possible; instead the pedal moves the hammers closer to the strings, allowing the hammers to strike with less kinetic energy. This produces a slightly softer sound, but no change in timbre. On grand pianos, the middle pedal is a sostenuto pedal. This pedal keeps raised any damper already raised at the moment the pedal is depressed. This makes it possible to sustain selected notes (by depressing the sostenuto pedal before those notes are released) while the player's hands are free to play additional notes (which don't sustain). This can be useful for musical passages with low bass pedal points, in which a bass note is sustained while a series of chords changes over top of it, and other otherwise tricky parts. On many upright pianos, the middle pedal is called the "practice" or celeste pedal. This drops a piece of felt between the hammers and strings, greatly muting the sounds. This pedal can be shifted while depressed, into a "locking" position. There are also non-standard variants. On some pianos (grands and verticals), the middle pedal can be a bass sustain pedal: that is, when it is depressed, the dampers lift off the strings only in the bass section. Players use this pedal to sustain a single bass note or chord over many measures, while playing the melody in the treble section. The rare transposing piano (an example of which was owned by Irving Berlin) has a middle pedal that functions as a clutch that disengages the keyboard from the mechanism, so the player can move the keyboard to the left or right with a lever. This shifts the entire piano action so the pianist can play music written in one key so that it sounds in a different key. Some piano companies have included extra pedals other than the standard two or three. On the Stuart and Sons pianos as well as the largest Fazioli piano, there is a fourth pedal to the left of the principal three. This fourth pedal works in the same way as the soft pedal of an upright piano, moving the hammers closer to the strings. The Crown and Schubert Piano Company also produced a four-pedal piano. Wing and Son of New York offered a five-pedal piano from approximately 1893 through the 1920s. There is no mention of the company past the 1930s. Labeled left to right, the pedals are Mandolin, Orchestra, Expression, Soft, and Forte (Sustain). The Orchestral pedal produced a sound similar to a tremolo feel by bouncing a set of small beads dangling against the strings, enabling the piano to mimic a mandolin, guitar, banjo, zither and harp, thus the name Orchestral. The Mandolin pedal used a similar approach, lowering a set of felt strips with metal rings in between the hammers and the strings (aka rinky-tink effect). This extended the life of the hammers when the Orch pedal was used, a good idea for practicing, and created an echo-like sound that mimicked playing in an orchestral hall. The pedalier piano, or pedal piano, is a rare type of piano that includes a pedalboard so players can user their feet to play bass register notes, as on an organ. There are two types of pedal piano. On one, the pedal board is an integral part of the instrument, using the same strings and mechanism as the manual keyboard. The other, rarer type, consists of two independent pianos (each with separate mechanics and strings) placed one above the otherâ€”one for the hands and one for the feet. This was developed primarily as a practice instrument for organists, though there is a small repertoire written specifically for the instrument. File:Samuelpost-BachBMajor.ogvPlay media A pianist playing Prelude and Fugue No. 23 in B major (BWV 868) from Bach's The Well-Tempered Clavier on a grand piano When the key is struck, a chain reaction occurs to produce the sound. First, the key raises the "wippen" mechanism, which forces the jack against the hammer roller (or knuckle). The hammer roller then lifts the lever carrying the hammer. The key also raises the damper; and immediately after the hammer strikes the wire it falls back, allowing the wire to resonate and thus produce sound. When the key is released the damper falls back onto the strings, stopping the wire from vibrating, and thus stopping the sound. The vibrating piano strings themselves are not very loud, but their vibrations are transmitted to a large soundboard that moves air and thus converts the energy to sound. The irregular shape and off-center placement of the bridge ensure that the soundboard vibrates strongly at all frequencies. (See Piano action for a diagram and detailed description of piano parts.) The piano hammer is "thrown" against the strings. This means that once a pianist has pressed or struck a key, and the hammer is set in motion towards the strings, the pressure on the key no longer leads to the player controlling the hammer. The damper keeps the note sounding until the key is released (or the sustain pedal). Length: All other factors the same, the shorter the wire, the higher the pitch. Mass per unit length: All other factors the same, the thinner the wire, the higher the pitch. Tension: All other factors the same, the tighter the wire, the higher the pitch. A vibrating wire subdivides itself into many parts vibrating at the same time. Each part produces a pitch of its own, called a partial. A vibrating string has one fundamental and a series of partials. The most pure combination of two pitches is when one is double the frequency of the other. Timbre is largely determined by the content of these harmonics. Different instruments have different harmonic content for the same pitch. 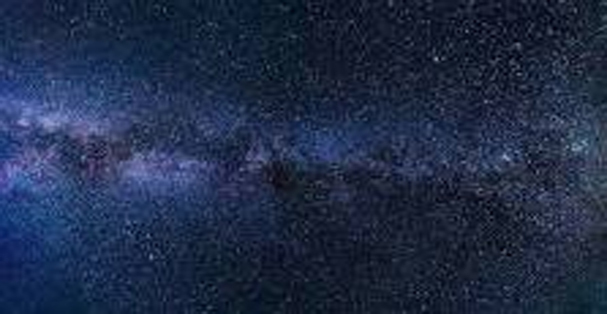 A real string vibrates at harmonics that are not perfect multiples of the fundamental. This results in a little inharmonicity, which gives richness to the tone but causes significant tuning challenges throughout the compass of the instrument. Striking the piano key with greater velocity increases the amplitude of the waves and therefore the volume. From pianissimo (pp) to fortissimo (ff) the hammer velocity changes by almost a factor of a hundred. The hammer contact time with the string shortens from 4 milliseconds at pp to less than 2 ms at ff. If two wires adjusted to the same pitch are struck at the same time, the sound produced by one reinforces the other, and a louder combined sound of shorter duration is produced. If one wire vibrates out of synchronization with the other, they subtract from each other and produce a softer tone of longer duration. Main article: Piano maintenance Pianos are heavy and powerful, yet delicate instruments. Over the years, professional piano movers have developed special techniques for transporting both grands and uprights, which prevent damage to the case and to the piano's mechanical elements. Pianos need regular tuning to keep them on correct pitch. The hammers of pianos are voiced to compensate for gradual hardening of the felt, and other parts also need periodic regulation. Pianos need regular maintenance to ensure the felt hammers and key mechanisms are functioning properly. Aged and worn pianos can be rebuilt or reconditioned by piano rebuilders. Strings eventually must be replaced. Often, by replacing a great number of their parts, and adjusting them, old instruments can perform as well as new pianos. Piano tuning involves adjusting the tensions of the piano's strings with a specialized wrench, thereby aligning the intervals among their tones so that the instrument is in tune. While guitar and violin players tune their own instruments, pianists usually hire a piano tuner, a specialized technician, to tune their pianos. The piano tuner uses special tools. The meaning of the term in tune in the context of piano tuning is not simply a particular fixed set of pitches. Fine piano tuning carefully assesses the interaction among all notes of the chromatic scale, different for every piano, and thus requires slightly different pitches from any theoretical standard. Pianos are usually tuned to a modified version of the system called equal temperament (see Piano key frequencies for the theoretical piano tuning). In all systems of tuning, each pitch is derived from its relationship to a chosen fixed pitch, usually the internationally recognized standard concert pitch of A4 (the A above middle C). The term A440 refers to a widely accepted frequency of this pitch â€“ 440 Hz. The relationship between two pitches, called an interval, is the ratio of their absolute frequencies. Two different intervals are perceived as the same when the pairs of pitches involved share the same frequency ratio. The easiest intervals to identify, and the easiest intervals to tune, are those that are just, meaning they have a simple whole-number ratio. The term temperament refers to a tuning system that tempers the just intervals (usually the perfect fifth, which has the ratio 3:2) to satisfy another mathematical property; in equal temperament, a fifth is tempered by narrowing it slightly, achieved by flattening its upper pitch slightly, or raising its lower pitch slightly. A temperament system is also known as a set of "bearings". Tempering an interval causes it to beat, which is a fluctuation in perceived sound intensity due to interference between close (but unequal) pitches. The rate of beating is equal to the frequency differences of any harmonics that are present for both pitches and that coincide or nearly coincide. Piano tuners have to use their ear to "stretch" the tuning of a piano to make it sound in tune. This involves tuning the highest-pitched strings slightly higher and the lowest-pitched strings slightly lower than what a mathematical frequency table (in which octaves are derived by doubling the frequency) would suggest. A Prague piano player. As with any other musical instrument, the piano may be played from written music, by ear, or through improvisation. Piano technique evolved during the transition from harpsichord and clavichord to fortepiano playing, and continued through the development of the modern piano. Changes in musical styles and audience preferences over the 19th and 20th century, as well as the emergence of virtuoso performers, contributed to this evolution and to the growth of distinct approaches or schools of piano playing. Although technique is often viewed as only the physical execution of a musical idea, many pedagogues and performers stress the interrelatedness of the physical and mental or emotional aspects of piano playing. Well-known approaches to piano technique include those by Dorothy Taubman, Edna Golandsky, Fred Karpoff, Charles-Louis Hanon and Otto Ortmann. Many classical music composers, including Haydn, Mozart, and Beethoven, composed for the fortepiano, a rather different instrument than the modern piano. The fortepiano was a quieter instrument with a narrower dynamic range and a smaller span of octaves. Even composers of the Romantic movement, like Liszt, Chopin, Robert Schumann, Felix Mendelssohn, and Johannes Brahms, wrote for pianos substantially different from 2010-era modern pianos. Contemporary musicians may adjust their interpretation of historical compositions from the 1600s to the 1800s to account for sound quality differences between old and new instruments or to changing performance practice. Birthday party honoring French pianist Maurice Ravel in 1928. 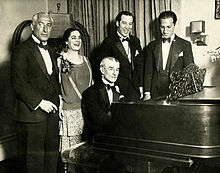 From left to right: conductor Oscar Fried, singer Eva Gauthier, Maurice Ravel (at piano), composer-conductor Manoah Leide-Tedesco, and composer George Gershwin. Starting in Beethoven's later career, the fortepiano evolved into an instrument more like the modern piano of the 2000s. Modern pianos were in wide use by the late 19th century. They featured an octave range larger than the earlier fortepiano instrument, adding around 30 more keys to the instrument, which extended the deep bass range and the high treble range. Factory mass production of upright pianos made them more affordable for a larger number of middle-class people. They appeared in music halls and pubs during the 19th century, providing entertainment through a piano soloist, or in combination with a small dance band. Just as harpsichordists had accompanied singers or dancers performing on stage, or playing for dances, pianists took up this role in the late 1700s and in the following centuries. During the 19th century, American musicians playing for working-class audiences in small pubs and bars, particularly African-American composers, developed new musical genres based on the modern piano. Ragtime music, popularized by composers such as Scott Joplin, reached a broader audience by 1900. The popularity of ragtime music was quickly succeeded by Jazz piano. New techniques and rhythms were invented for the piano, including ostinato for boogie-woogie, and Shearing voicing. George Gershwin's Rhapsody in Blue broke new musical ground by combining American jazz piano with symphonic sounds. Comping, a technique for accompanying jazz vocalists on piano, was exemplified by Duke Ellington's technique. Honky-tonk music, featuring yet another style of piano rhythm, became popular during the same era. Bebop techniques grew out of jazz, with leading composer-pianists such as Thelonious Monk and Bud Powell. In the late 20th century, Bill Evans composed pieces combining classical techniques with his jazz experimentation. In the 1970s, Herbie Hancock was one of the first jazz composer-pianists to find mainstream popularity working with newer urban music techniques such as jazz-funk and jazz-rock. Pianos have also been used prominently in rock and roll and rock music by entertainers such as Jerry Lee Lewis, Little Richard, Keith Emerson (Emerson, Lake & Palmer), Elton John, Ben Folds, Billy Joel, Nicky Hopkins, and Tori Amos, to name a few. Modernist styles of music have also appealed to composers writing for the modern grand piano, including John Cage and Philip Glass. $60.00 hr + $10.00 travel exp. Click the chord you want and then the [Display] button. as a Bass Guitar Solo. This site is owned and maintained by Closetlabs Publishing Co. Content copyright© 2007 - 2019 closetlabs.com - All rights reserved.